With the following once again I am blowing away from the mechanic the dust of an heliboy. Normally, my looks are not that much distorted - but rpm driven without a Gyro and a mixer on a tail-rotor. 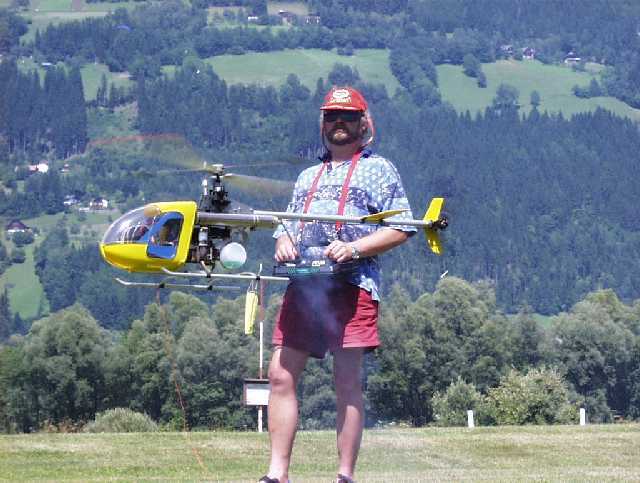 My name is Eberhard Hof (1951-2010), flying aircraft models since being 11 years old. 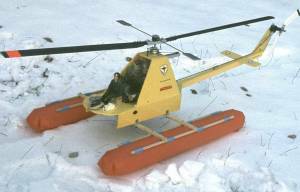 My first helicopter model I built and flew 1972. This www-site I did create to keep my grey cells moving and to assist the one or other griefing and whailing helipilot. Moreover, my main intention is to keep the first-time RC-helicopters from extinction. This website shall provide a platform for trading, finding and restoring nostalgy RC-helicopters or spare-parts thereof. The site only lives from the cooperation of collecters and pilots of helioldies. This idea hit my mind, because for my part I found the constant struggle to upscale modern RC-helis totally unnecessary. My aeronautic skills were not really enhanced by modern hightech electronic components and CNC cut mechanical parts. WARNING: Once the heli-virus has struck you, you will be infected beyond healing. For risks and side-effects ask your doctor or your better half. Pictured is my first model helicopter, a box made out of light plywood. To its bottom the oil-pan of the Cobra-mechanic was screwed to. The tail-extension was built out of balsa-wood. The head of the rotor was from the Wilfried Klinger company. Alongside the balsa-extension the brass pipe for the flexible shaft was attached. With this vehicle I honestly learned to fly - crashfree. The crash came with the first turn - ascending vertically and then reduce the gas (as with the RC-1 model). From this reduction of power the heli never recovered - being dependent on the rpms - and crashed. Well, if I would have known what I know now. Here you find a video-display (463KB) showing a flight with this home-made trainer. Note: Since 2010, the Year my Father died unexpectedly, I lead the side on in his mind. My Name is Martin (DOM 1970).